Want to Reduce Turnover and Improve Productivity? Start by Listening. We’ve been talking to a lot of (OS1) users recently, gathering input on what they experience on a day-to-day basis so we can improve our training. 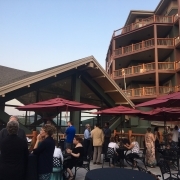 At Symposium, we speak with leaders of organizations like Sandia National Labs, University of Texas at Austin, Los Angeles Habilitation House, Michigan State University and others to identify best practices, but what about the people actually doing the cleaning? What ideas do the janitor—(OS1) specialists—have for improvement? A common concern we’ve heard is regarding the general absence of meaningful communication between custodial workers and their department leaders. This is an issue in organizations everywhere—not just (OS1) organizations, cleaning organizations, big corporations or small start-ups. Fun fact: The average person has an eight-second attention span. Listening is a learned skill that takes practice, but when done well, can create more productive teams. 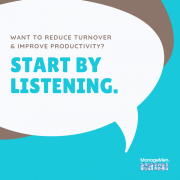 A leading consulting firm found that organizations that communicate regularly with their staff — and do a good job of listening — are likely to have lower turnover. This isn’t surprising, because communication helps eliminate the opportunities for misunderstanding so that everyone is on the same page. But the average human has an eight-second attention span, so we could all probably use some room for improvement. Just listen. A lot of listening is just that—truly listening. When someone takes the time to speak, focus your mind on what that person is saying rather than that list of “to-do” items sitting on your desk. Don’t interrupt or attempt to offer solutions as the person is talking, just listen. Put the phone away. Let the employee know that they are your immediate priority when you are speaking to them. Your phone might buzz or ring, but by disregarding the impulse to pick it up, you’re showing the employee that they have your full attention and are truly listening to what they are saying. Check your preconceived notions at the door. If you think you know what the other person is going to say before you go into a conversation with them, you’re already halfway down the path of not listening. Clear your mind so you are truly open to what they have to say. Consider timing. It’s hard to be a good listener if the other person isn’t willing to talk. If this is the case, try catching members of your team while they are working. Custodial workers spend a lot of time with their thoughts because they often work alone, so by making it a priority to check in with your team when they are working, you may catch them in their comfort zone and get a better understanding of what’s on their mind. Ask more questions. A lot of times, we want to help offer solutions or solve problems for people on our team. Rather than responding with an answer right away, ask more questions. This can help create a safer space for the employee and encourage them to speak more. Summarize what was said. Active listening is a common communication tool people use to let the other person know that they heard what was said. In addition to validating that you are listening, repeating a summary of someone’s statements back to them helps clear up any miscommunication that may have occurred. Silence your inner interrupter. When we think we know what the other person is saying, we can have a tendency to jump into the conversation and respond before the person is done speaking. This can be detrimental to the conversation, not only causing the person to shut down, but also possibly shifting the speaker’s intent in another direction. It can be extremely difficult in some situations, but it’s a best practice to always wait until the other person is finished speaking. https://managemen.com/wp-content/uploads/2019/02/Listening-SOCIAL.png 800 800 Andi Curry https://managemen.com/wp-content/uploads/2015/06/ManageMen-trans.png Andi Curry2019-02-21 17:24:242019-02-21 17:24:27Want to Reduce Turnover and Improve Productivity? Start by Listening. When people are first introduced to Six Sigma, a program used by businesses for continuous improvement, one of the first things they’re asked to do is to draw a happy pig. Without any instruction, you can imagine the different types of drawings people create! After everyone shows each other their work and the variation in the drawings becomes apparent, they are then provided a set of instructions and asked to draw the pig again. This time, they find that the drawings look remarkably similar. The point of the exercise is to demonstrate how when a group of people have instruction, most will produce a consistent result. Standardized systems and products are what make a Big Mac in Des Moines, IA, taste the same as a Big Mac served in Kroc’s first restaurant in Des Plaines, IL. Standardization is the hallmark of efficiency—just think about the ISO 9000 quality management and quality assurance standards. But for some reason, standards are lost when it comes to custodial departments. Organizations implement standardized processes throughout their customer service, warehouse, purchasing and human resource departments… but they neglect to think about how the custodial department could benefit from standardized processes. In the first part of this series, we discussed the rise of “greenwashing” and how when the demand for sustainable products grew, suppliers marketed their products as good for the environment when they really weren’t. Similarly, there are a lot of cleaning companies out there that make claims that they know how to clean, but they often lack the knowledge, processes and systems to ensure a consistent level of cleanliness. They think that anyone can pick up a mop and clean. But when was the last time they changed the water and solution in the mop bucket? Are they using the same mop to clean the restrooms, hallways and kitchen areas? Do they put up the proper signage in public areas to reduce the chance of slips and falls? We’ve found that cleanwashing happens more often then you’d think because so many people believe that anyone can clean. But another part of the issue is that people don’t think or ask how something is cleaned, just that it looks clean. And that’s a dangerous oversight. As anyone in this industry knows, there are a lot of things that can go undetected to the visible eye. Just ask any cleaner who has worked on a cruise ship and had to deal with Norovirus or a custodian who has had to deep clean a school during a flu outbreak. Let’s think back to the happy pig picture. What happens when you hand someone a flat mop with little to no instruction? Just because the floor has been mopped, has it been cleaned? The individual might work from left to right, he or she might walk in circles around the floor, walk around areas that have already been mopped—there’s really no limit to the way one might approach mopping a floor. They could be moving soil around, not removing the soil. More organizations are focusing on standardization to help them streamline practices and help improve processes moving forward. How Does Standardization Help Improve Organizational Excellence? When we think of standardizing processes, you may think that it would only be beneficial to franchise operations or by businesses that repeat work throughout more than one location. For example, a contract cleaner would benefit from standardizing job duties and processes so someone can pick up a job in Building A and repeat it in Building D or F—wherever they are needed, delivering the same exact quality of work. But occupational theorists have found that the benefits of a standardizing processes go beyond delivering a consistent product. It can also be a tool to empower and retain employees. Standardization takes the guesswork from the task and means that employees have an established, time-tested process to use. Organizations use standardized processes to boost productivity and improve employee morale, because employees can take pride in knowing that they have mastered a given task. Fast Company says that organizational standardization can fuel innovation. And there’s a good chance we’ll only see more standardization in the future. The prestigious Wharton School of Business says companies are increasingly moving toward standardization. When it comes to cleanwashing, standardization gives anyone who is either directly or indirectly responsible for the cleaning and maintenance in their building with a set of guidelines. It also allows for the development of metrics. In an ideal scenario, all custodial positions are workloaded, and workers are kitted with the exact tools and supplies they need for the day. They follow a specific set of instructions detailed on a card so areas are cleaned the exact same way, each time, delivering a standard result and a consistent level of clean throughout every building. How Can We Combat Cleanwashing? — Removing soil versus moving soil around. — Worker training and safety. — The impact of cleaning on health. — The cost versus the price of clean. — How standardization impacts the overall quality of clean. As we illustrated in the first part of this series, there is an increasing demand for clean facilities. People spend money in buildings that are clean. But it’s important for the people who live, work and visit those facilities to understand that just because something LOOKS clean, it doesn’t mean that it necessarily IS clean. When there’s a standardized process in place, you have the peace of mind in knowing that the outcome is consistent — every time. According to Scientific American, the term “greenwashing” involves “falsely conveying to consumers that a given product, service, company or institution factors environmental responsibility into its offerings and/or operations.” Put simply, a company says their product or service is sustainable when it is not. We’re starting to see the same thing happening with professional cleaning services. More than ever, consumers understand the benefits and desire a clean facility in which to live, work, learn and shop. As a result, they are spending more money — and time — in buildings they feel to be clean. RETAIL CLEANLINESS: One study of approximately 2,100 U.S. adults found that 93 percent of those surveyed would not return to a retail store if they experienced issues with its facilities. 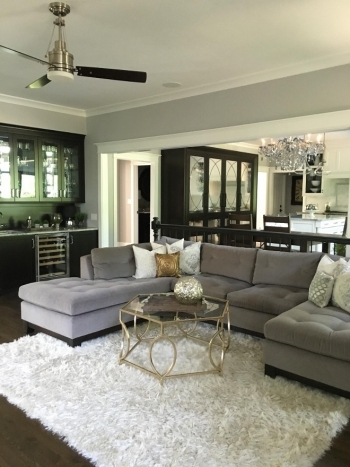 The cleanliness issues that mattered most included bad odors, dirty restrooms and other dirty surfaces, and miscellaneous areas like entryways. RESTAURANT CLEANLINESS: Restaurant Business reports that 59 percent of consumers say that cleanliness is very important when choosing where to dine, even compared to other considerations such as service, value and order accuracy. SUPERMARKET CLEANLINESS: Supermarket News reports that store cleanliness is just as importance as quality and freshness of the food in a supermarket experience survey. MILLENNIALS WANT CLEAN: When it comes to millennials, the need for clean increases. A Marketwatch report highlights that three in four millennials (77 percent) thoroughly clean their homes at least once a week compared to 42 percent of Baby Boomers. Driven by images that regularly populate social media channels such as Instagram, many Millennials have a different view of “clean” compared to older generations. You see, in the U.S., the cleaning industry is engaged in a decades-long battle against a misconception gripping most Americans. That misconception is that anyone can clean. And while it’s true that most people can clean, the fact remains that they need to be educated on how to clean properly. Otherwise, there’s a good chance that they’re just moving around dirt from one location to another. Or, cleanwashing. 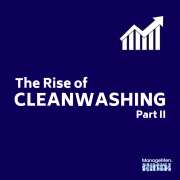 Without organizations to govern claims made by cleaning operations, we will experience a flood of companies making unsubstantiated claims around the efficacy of their work. 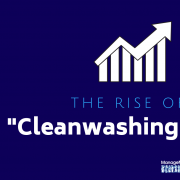 In the second part of this series, we’ll look at what is cleanwashing and steps that facility managers, building owners and others who procure cleaning service can take to avoid it and steps cleaning organizations can take to separate themselves in an increasingly crowded marketplace. You’re in a tough business—we’ll just put that out there. The people who make it in this industry are problem solvers. Every day, they put together a new puzzle — figuring out which piece needs to go where to complete the puzzle of a clean building. Maybe one piece involves covering for a janitor who called off work and another is delayed supply delivery… each day presents a unique set of challenges. When we go into a new business to set them up on the (OS1) System, we often hear a common set of complaints. It doesn’t matter if it’s a laboratory on the east coast or a University in California. 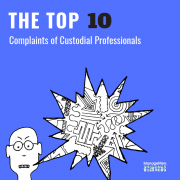 A very common set of issues exist for custodial professionals everywhere. So you know you’re not alone, we’ve pulled together a list of complaints and frustrations that we hear. 1. Not enough/broken/wrong equipment. People who don’t understand cleaning don’t realize that you need more than a vacuum and a microfiber mop to keep floor surfaces clean. In addition to cordless equipment, carpet extractors, burnishers, strippers and dryers are all necessary pieces of equipment to maintain and protect floor surfaces—at least if you don’t want to replace carpet or tile every few years. 2. Chemical musical chairs. Too often, custodial professionals are at the whim of their purchasing department when it comes to buying cleaning chemicals. While the type of chemical might be the same, the brand might be different which can cause confusioTop n for custodial workers. Standardization is key in order to establish effective SDS programs and reduce injuries. 3. Not enough mats/no matting at all. Keeping floors clean inside the building starts well before someone walks through the front door. A combination of scraper and entryway matting can help trap dirt before it tracks onto the floors. But adequate matting is only half of the puzzle—mats need to be regularly laundered so they can work as designed. 4. No training resources. Overcoming the common misconception that “everyone knows how to clean” is one of the biggest challenges faced by custodial professionals. An effective custodial operation will have an established classroom training program that includes training aids, videos, work-flow charts and tools to assist with comprehension. A training classroom equipped with training materials is key to developing a high-performing and engaged custodial team. 5. Supervisory void/exasperated supervision. Supervisors are in a tough spot—not only are they responsible for overseeing custodial workers, they are also often the point of contact for building occupants whenever there’s an issue. Custodial supervisors need to be well trained to do the job properly— and well compensated. 6. Unmotivated staff/skeptical staff. When dealing with so many nationalities, personality types and ages, it can be tough to get custodial workers to rally behind a greater goal or the vision for creating a clean indoor environment. Training, compensation and a structure for advancement can all help workers buy-in to your organizational goals. 7. Lack of respect. Every now and then, you’ll see a news story about an elementary school that surprises a custodian with a generous act to show their appreciation, but the large majority of custodial workers feel invisible in the buildings where they work. Even if employees work at night, recognizing workers through appreciation events such as International Housekeepers Week or Custodial Workers Recognition day can help bolster morale and help workers feel that they are respected. 8. Rotating door. For a lot of people, custodial work is a “filler” job. By that, we mean that it’s something people do to supplement their income for a period of time or maybe it’s something that helps get them by in their pursuit of another position. This often leads to high turnover rates. Providing opportunities for advancement, recognition and living wage compensation will help close this door. 9. Injuries. Because of the strenuous nature of custodial work, a lot of custodial professionals experience injuries— in fact, double the number of injuries compared to other industries. By training workers and helping them warm up for their work day, we can help reduce these injuries. 10. Lack of input. How many times has your department been tasked with cleaning a new building that you’ve had no input in designing? Not giving custodial professionals a seat at the table of broader organizational decisions (like new building construction) can leave money on the table. Have an issue we haven’t covered? Let us know, we’ll add it to our next list! Have you ever heard of Colonel George Waring? He’s kind of a big deal in the cleaning and sanitation world. Before he fought in the Civil War, Colonel Waring was a city engineer in New York, where he gained recognition for his work reclaiming the swampland that would become New York’s Central Park. He had helped develop a first-of-its kind drainage system that allowed for the lakes and ponds within the parks, while leaving the remainder of the land dry. Following his success in New York, Waring left for Memphis, where he engineered a dual sewer and drainage system that separated storm runoff from septic waste. This ended decades of waterborne illnesses and diseases, including cholera, which had plagued the city for decades. 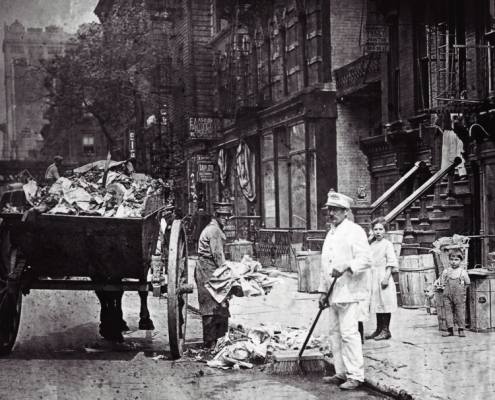 Lacking any formalized sanitation and refuse system, New York City was drowning in garbage and filth in the late 1800s. Its current mayor, William Strong, called for Waring to return and assume the position of sanitation engineer. The job of tackling the city’s overwhelming sanitation issues would be no easy feat, and Waring approached the job as he would approach combat on the battlefield. 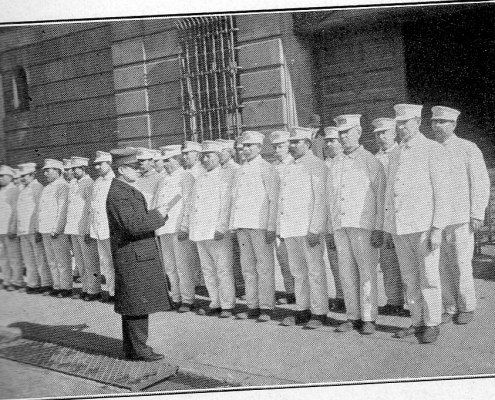 Colonel George Waring transformed the image of the sanitation department in New York, dressing workers in white so they would be affiliated with hygiene and cleanliness. His first initiative was to build an army of cleaners, equipped with ashcans and broomsticks as their weapons. But before he cleaned up the streets, he knew he needed to clean up the perception of the cleaners. Street cleaners of the day were known for accepting bribes and generally slacking off on the job. To transform this image, Waring assembled a force of more than two thousand sanitation “soldiers” who were clad completely in white, from the white caps on their heads down to the pants covering their legs. The motivation was to associate workers with hygiene (though other sources indicate that it was to also make workers obvious and easily identifiable should they feel compelled to skip off to the saloon during their shift). With his system in place, Waring and his army set to clean the poorest sections of the city (the more affluent areas had enlisted private cleaning services to clean up their streets). Initially, the sanitation workers were met with resistance, and local residents threw rocks and bricks at workers, fearful they intended to displace them. 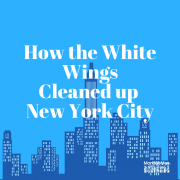 By the end of two weeks, the White Wings had won them over because their neighborhoods were clean. Eventually, the piles of trash throughout the city had been completely cleared. Workers clean up the streets of New York in the late 1800s. Cleaning as a hygiene issue. A systematic approach to cleaning. Improving the perception of cleaners. Sound familiar? 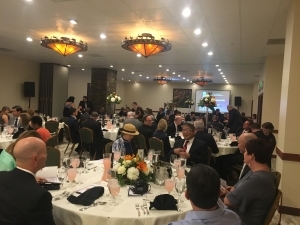 “Please raise your hand if this is your first Symposium,” Kristie McNealy, MD, Executive Director of the Simon Institute instructed the packed room. More than a dozen hands shot up in the air. “Welcome! We have a great lineup of presentations and activities planned,” she promised. 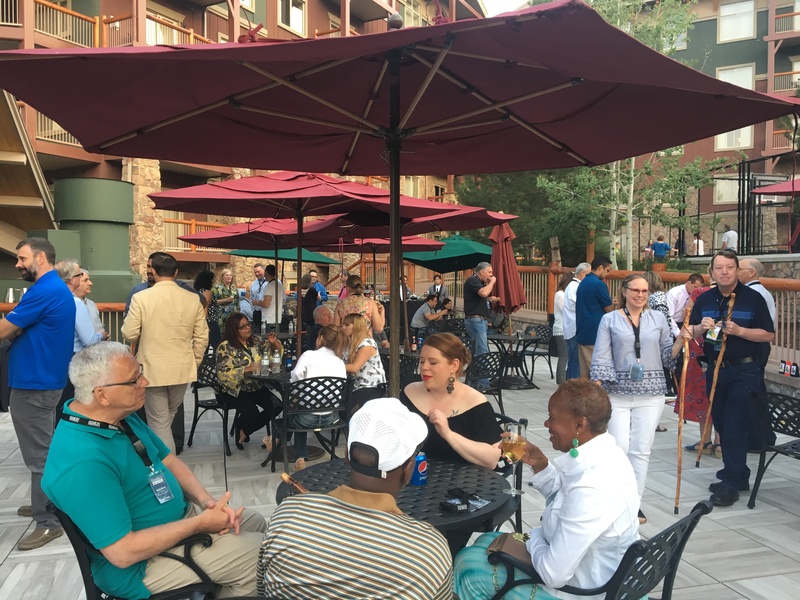 Two days later at the conclusion of the conference, attendees agreed—the 17th Annual Symposium at the Westgate in Park City, Utah, delivered. Facility professionals from across the country gathered at the annual event where (OS1) users and other cleaning executives discuss best practices and learn about new tools and equipment to improve safety and productivity within their custodial operations. It’s different from other industry conferences in that a majority of the sessions highlight actual product trials—speakers offer candid reviews of how a product or system worked within a facility. Kicking off the 2018 Simon Institute Symposium. 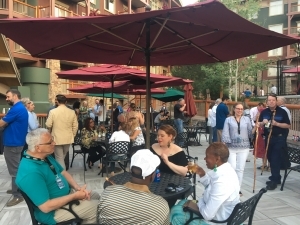 New and old faces mingle at the Welcome Reception. 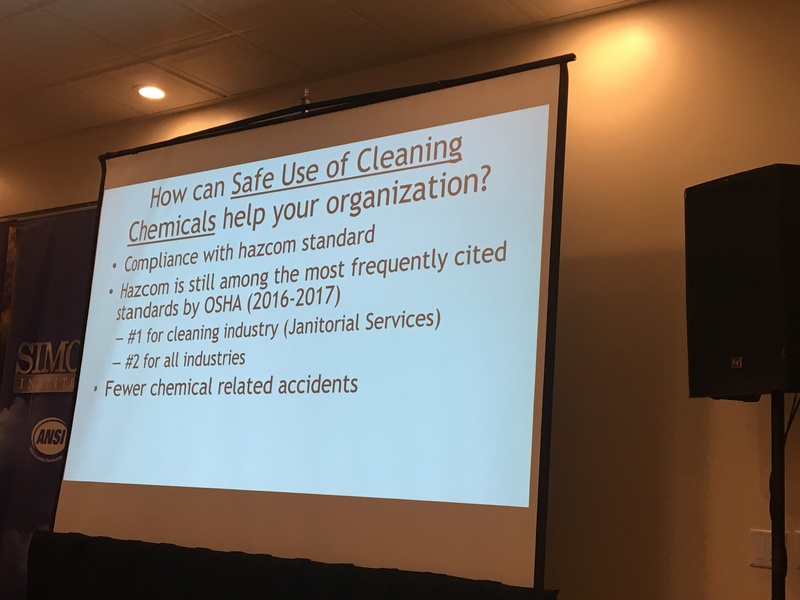 Morning presentations opened with some great updates about the Safe Use of Cleaning Chemicals – ANSI/SI BSR SI-0001 Standard. Understanding the need for a standard. Look at this group! 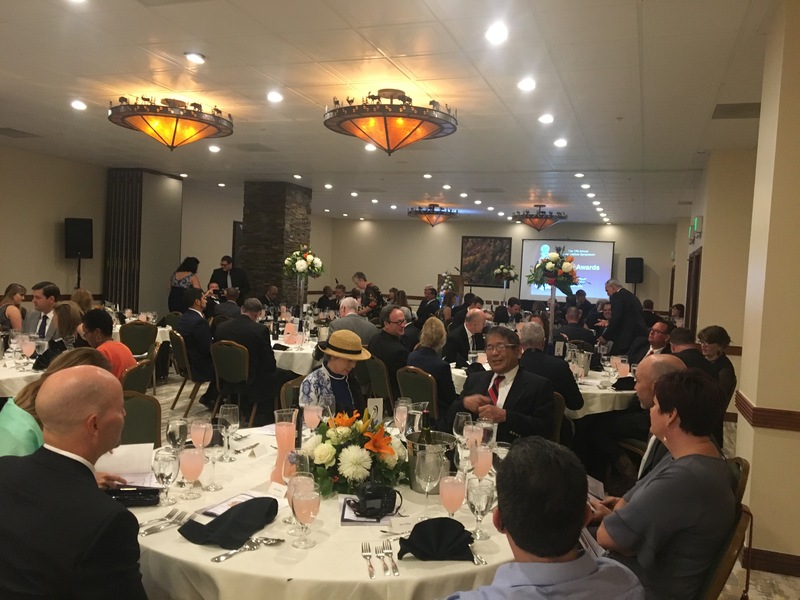 All dressed up for the 2018 Cleaning Industry Awards Banquet. Three new awards were presented during this year’s Cleaning Industry Awards Banquet. 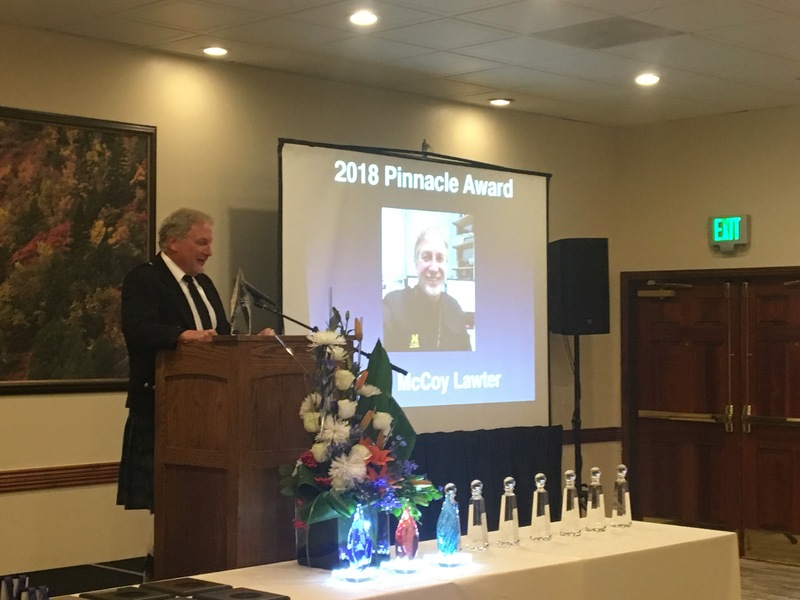 John Lawter of the University of Michigan accepts the 2018 Pinnacle Award, the highest honor presented during the evening. Cynthia Rivera of Sandia National Labs wowed attendees with her study of how the OS1 System promotes best practices in ergonomic safety. 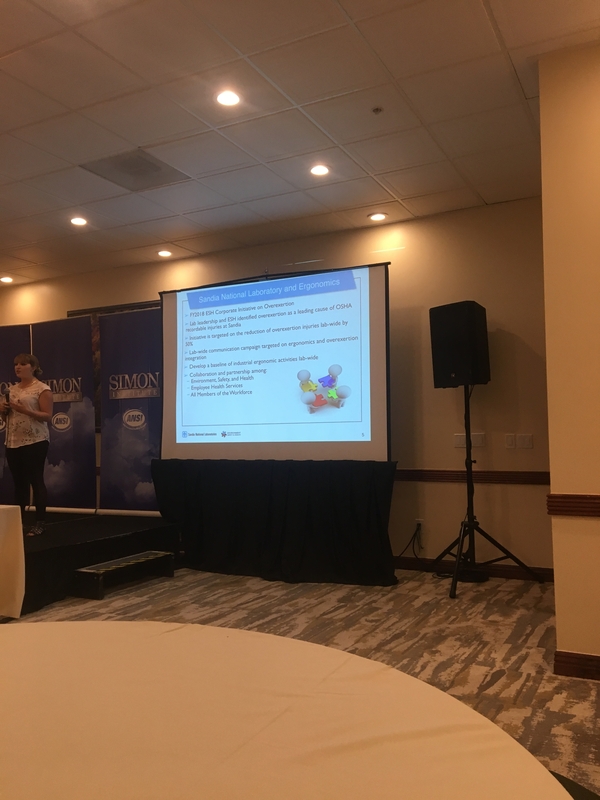 Simon Institute is an ANSI-Accredited Standards Developer, and McNealy kicked off the event with an exciting update about the status of the Safe Use of Cleaning Chemicals- ANSI/SI BSR SI-0001—it will soon go out for public review and comment. 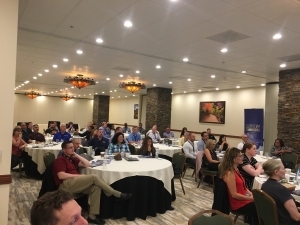 Additional sessions covered topics including strategies for improving recycling diversion rates, understanding blockchain technology and future applications within the facility management industry and ways workers and cleaning organizations can leverage the gig economy. 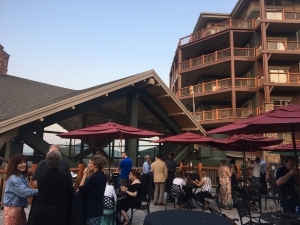 During the evening, attendees donned in evening gowns and tuxedos enjoyed dinner before the annual Cleaning Industry Awards ceremony. Janitors from as far as Barbados were recognized for their performance, as Mark Unger from Unger Enterprises presented the Outstanding Cleaning Worker Awards. Attendees to this year agreed, the breadth of information and relevant insights presented this year was unparalleled. 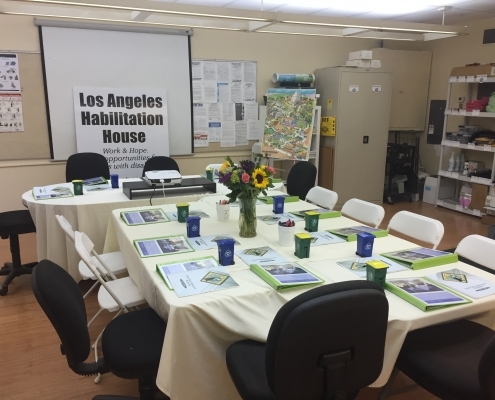 Your office, supply areas, training and break rooms are located in the basement or another out-of-the-way location. 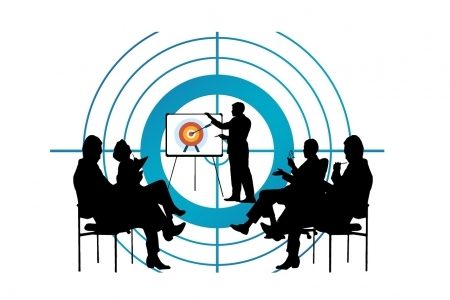 When department heads gather to discuss an upcoming event or program that will impact your entire organization, you are left out of the conversation. When budget cuts happen, your department is often the first to feel the impact. Cue the Aretha Franklin, because if any of these statements left you nodding your head in agreement, it might be time to generate some much deserved R-E-S-P-E-C-T for the incredible work your team is doing. It’s not that people intentionally overlook custodial departments, it’s that often times, custodial managers and employees are reluctant to talk about the importance of their work and boast about their accomplishments. Because what happens when you don’t promote your work is that you aren’t top of mind, and as a result, you might be getting left out of things unintentionally. So how do you educate others about the importance of cleaning and stay top of mind for visitors, employees and other occupants in the buildings you help maintain? Print this out to keep on your desk and regularly remind yourself of ways you can promote your custodial department. Friends, welcome to the world of public relations. 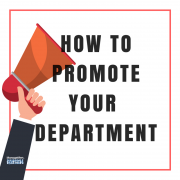 We have a few simple strategies that you can use to help others in your building understand the importance of your department, thereby moving you to the head of the class (or at least, that’s the goal). Create employee recognition events. If you don’t already, you can recognize staff through events like International Housekeepers Week, Environmental Services Week and Thank a Cleaner days. Invite other departments to participate, by nominating a special custodial worker who has gone “above and beyond” or writing a letter to the entire staff to show appreciation. Another option might be to create a “Janitor of the Month” program where others in the facility are asked to recognize all-stars on your team. This strategy will not only empower and incentivize your employees, it will encourage others to think about how your team helps them. Develop signs and posters. If you’re using a special program, like our (OS1) System, have achieved a certain accreditation like Green Seal, or are using another program with benefits to building occupants, consider working with your marketing department to create special posters, table tents or signs to let people know that their building is cleaned in a way that limits the impact on their health and the environment. If you don’t have a marketing department, not to worry! There are several easy-to-use online design websites you can use (for free! ), like canva.com. Simply create the material and either print it off yourself, or take it to your local print shop for a professionally printed product. Keep people informed through a monthly email or newsletter. Yes, it will take a few minutes to pull together, but you will see an immediate benefit from this effort. When looking for items to include, consider not only the “news” about your department, such as personnel news, upcoming activities or achievements, but also the human-interest news that could be of interest to readers. For example, you might consider profiling a team member each month or sharing stories of activities they like to participate in when they’re not at work. Humor can also be an effective way to keep readers engaged, so consider including a monthly picture of something funny or unique your team found on the grounds. The most important part of creating a newsletter is to make sure you do it regularly. If you don’t have the time or have concerns about how much you have to include, a quarterly newsletter would also work—just make sure you do it once you start. Apply for industry awards. 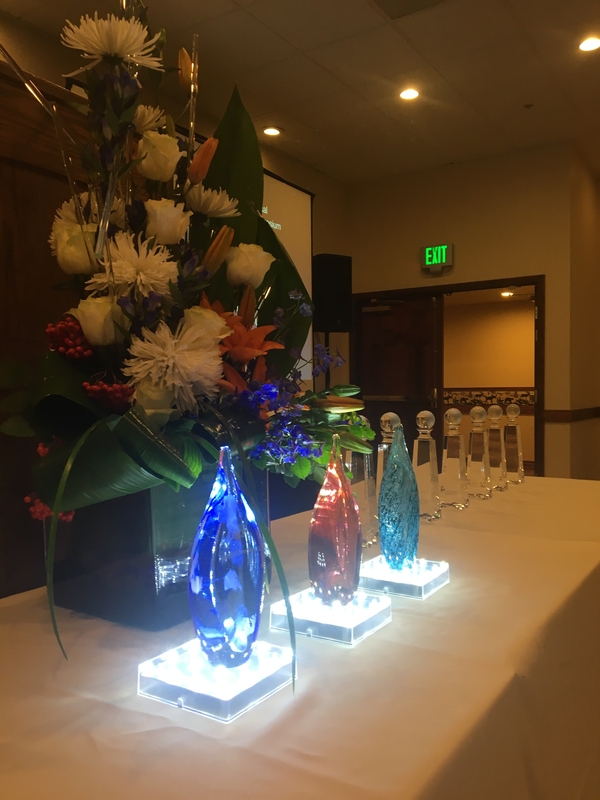 The cleaning industry has several awards that recognize superior managers, cleaning programs, frontline cleaners and custodial departments. Receiving an award not only gives you recognition throughout the industry, but it also will validate the integrity of your program within your facility, helping others realize you have a best-in-class operation. Even if you don’t decide to do any of these things, you may just want to think about tooting your horn a little more. We’ve seen way too many people doing great things not receive the recognition they deserve because of their modesty and humility. An excellent, well-managed cleaning program benefits everyone, so let’s talk about it! Millennials seek engagement, so by giving them a voice and asking for their input, you can help increase their workplace satisfaction. The “greying” of the cleaning industry is a hot button topic for a lot of people these days. Over the next few years, we’ll experience a mass exodus as baby boomers leave the cleaning industry to retire. According to a recent article in Contracting Profits, one third of janitors and one third of supervisors are age 55 and over. But this situation isn’t unique to end-user segment—we can also expect to see vacancies throughout the manufacturer and distributor side of the industry too. Of additional concern is that very few organizations are planning for what happens after these workers leave. A recent reader survey from Facility Cleaning Decisions found that more than half of custodial managers (56 percent) do not have a succession plan in place for themselves and/or a manager on their staff. The need for attracting younger talent to the industry is very real, as we risk losing a lot of tribal knowledge as retirees pack their bags. But when we talk about attracting millennials to our industry, we need to move past the technology conversation. 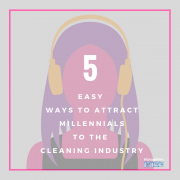 Sure, most millennials were born with a cellphone in their hands, but that doesn’t necessarily exempt the cleaning industry from being appealing to a younger demographic. In fact, there are several things about it that could be appealing to younger workers — depending on how your department is structured. We’ve pulled together a list of simple things we can do to make any department—from jan/san sales to custodial operations—more appealing to millennials and beyond. Give younger workers a voice. Rarely do managers tap new employees for input. Understandably, we spend a lot of time talking—talking as we train on policies and procedures. Talking as we introduce them to other coworkers and staff. But we also should spend time listening to these new workers. By engaging them and asking them for their impressions on a regular basis, we help give them a voice—something that is important to a generation that seeks closer relationships with their bosses and more engagement. Talk about the importance of cleaning. Millennial workers want work that has more meaning—they aren’t as happy making widgets for company XYZ as their parents were 20 years ago. They want to know that their work makes a difference and helps others. As such, we should help them understand the importance of cleaning—how cleaning not only plays a big role in the health of building occupants, but also in their productivity. Use it as a talking point during the interview process and in ongoing meetings. Create more opportunities for women. The cleaning industry has long been known as a male-dominated industry, but there are many women who have created successful careers for themselves in the cleaning industry. Initiatives such as mentorship programs to workplace inclusion policies can help increase the number of opportunities to women and create diversity in our workplaces. Give back to the community. Cleaning is a service-based industry, and a service that can be easily used when it comes to giving back to the surrounding community. 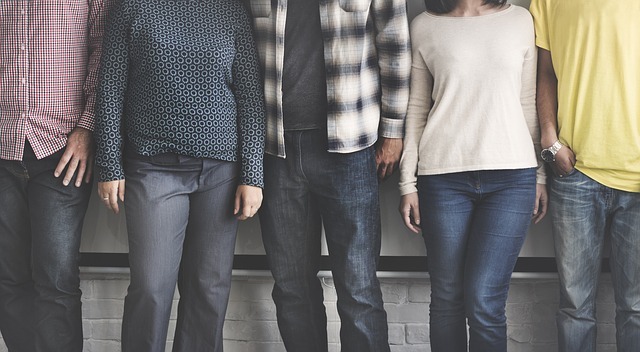 Organizing events where your department can help clean-up a local non-profit, provide products to a shelter or even work with a local organization to provide job training will not only benefit the community, but can be attractive to socially-minded millennials. Make [more] learning opportunities available. Growing up with the internet has its benefits, and an increased hunger for education and learning is one. The high school graduation is the highest in more than two decades (72 percent) and of those graduates, 68 percent have enrolled in college. Because these workers are constantly consuming information through digital devices, workplaces should make sure workers also have access to the information and opportunities they need to perform their jobs to peak performance. Even if your workplace doesn’t provide reimbursement programs, work with employees who demonstrate an interest in ongoing education to create time for them to attend events. Low unemployment rates are making the fight for quality employees tougher than ever and professionals everywhere are starting to see that we can’t just do things the way we’ve always done them if we want to attract and retain young professionals to our workplaces. Keeping these strategies in mind will help make sure your organization is prepared for future success. When it opened in 2001, the California Environmental Protection Agency headquarters was touted as the “greenest high rise in the nation.” Waterless urinals were installed, expected to save more than 1 million gallons of water each year. Looking exclusively at the environmental benefit, engineers who called for the new technology neglected to look at how the urinals would be used and maintained. After “hundreds” of complaints about foul odors and wet floors along with “high” maintenance costs, the units were removed six years later. 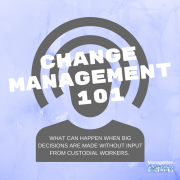 Most cleaning professionals and facility managers understand that any change is difficult, but attempting to implement anything new—a new product, system or technology—will be more difficult without first getting input and buy-in from custodial workers. In fact, some reports indicate that not getting enough buy-in from enough people can cause as much as 70 percent of organizational change efforts to fail. Depending on how long they’ve been with an organization, a custodian will be able to tell you what has happened in the past when someone tried something similar. They can also give you good insight into issues you might experience. In the case of waterless urinals, experienced custodians would have been able to tell you that a waterless system would take a lot more to clean than traditional urinals. Another good example is air blade hand dryers — it’s often not until installation that anyone considers how the units will be cleaned and how they’ll impact the custodial department, its daily workload and its workers who will ultimately be responsible for its daily maintenance. Does that mean you should abandon all efforts? Not at all, but involving custodians from the start can help avert future issues. Communicate regularly. Talk to the custodial team about what you want to do and why you want to do it. When custodial workers have a good understanding of the full picture of what you want to achieve, they will be more likely to buy into the process. It can also be beneficial to have a distributor or manufacturers’ representative speak to staff about the product so it comes a person who knows the product or equipment and can field specific questions about it. Start small. A pilot test gives your team members an opportunity to test the solution and see how it works—or doesn’t work. Start in a single area or building to measure performance, give users a test-drive and identify any issues that could arise. How well do you think this product worked? Do you think this product will improve the way you clean (creating cleaner buildings or making it easier for you to clean)? Do you anticipate any issues with this product? If so, what? Do you think this is something we should implement in other areas? From the Internet of Things (IoT) to self-cleaning surfaces, online training to disinfectants with shorter dwell times, the cleaning industry has several new products and technologies that promise to improve the way buildings are cleaned and maintained. But before we buy into the marketing claims and place a big order, it can pay dividends in the long-run to engage the people who are likely to be the most impacted — the custodians. When I started my job as a housekeeper at the only hotel in my small town, I was shown my cart, a vacuum and how to make a bed. The “trainer,” or the woman I was supposed to follow for the day, had called off work, so I was on my own. “If you have any questions, just dial number one on the phone,” said the housekeeping manager. And off I went. I was 17 at the time, and my mom will be the first to tell you that I didn’t know a thing about cleaning my own room, let alone 10 rooms in a hotel. I lasted about two weeks. I am process driven and there wasn’t a single procedure in place in that department (at least, no procedures that were shared with me). I also love science, and I had no idea that a lot of what I was doing had a scientific application. When I completed my assigned rooms, I clocked out and told my boss I’d see her tomorrow. That was it. Too often, people treat cleaning like it’s something that anyone knows how to do, but there’s a big problem with that approach. It gives the unspoken message to custodians and housekeepers that they are replaceable. If they don’t show up, anyone can come in and do their job. When there’s little to no training, it tells them that the job isn’t skilled. It doesn’t show them that they can actually make a career—a good, well-paying career—in the cleaning industry. Ultimately, treating cleaning like it’s something that anyone knows how to do reduces the value of both the work and the people performing the work. Is there any wonder why custodial operations have problems with turnover and attracting younger people to the industry? At ManageMen, when we look at cleaning, we see it as a profession grounded in three disciplines. 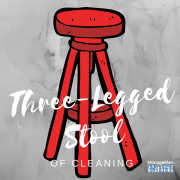 We refer to these disciplines as the “three-legged stool” of cleaning. When you don’t ground your custodial operations with these elements as your foundation, you’ll be more prone to common issues such as outsourcing, high turnover and low employee morale. There’s also a good chance you’re actually polluting the indoor environment rather than cleaning it. Engineering: The standardization, simplification, best practices and ongoing benchmarking of a cleaning program amongst top organizations that establishes as a best-in-class operation. Science: The studies and research that validate the engineering elements of the cleaning operation, methods to improve safety and compliance with workplace safety laws, pollution reduction and development of workplace topophilia (or the love of the indoor environment). Professionalism: Systems that enhance value of and appreciation for cleaning workers in the overall building operations, through education, skills validation, career path and recognition programs. We all know by now that the cleanliness of our buildings has a huge impact on the health and productivity of building occupants, while also playing a key role in an organization’s brand. It can also be a differentiator when trying to attract new customers or employees — who wants to work in a dirty building? Rather than treating custodial like Cinderella — pushing her to the background while other areas get more attention and budget — we need to start grounding our custodial operations in engineering, science and professionalism. Custodial work is not a job that just anyone can do. It’s a profession that requires skilled training and respect. When we treat it as such, we’ll not only improve the levels of cleanliness in our buildings, but perhaps we’ll give new workers to our industry a better appreciation for the work and how they can build a successful career in this industry.